Guests can expect spectacular accommodation, private pools, hot tubs, gyms, games rooms, movie theaters, bowling alleys and much more. 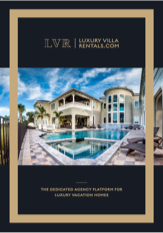 Access to 1,000s of the best vacation homes in over 50 destinations worldwide. An advanced, customizable white label site featuring your own branding, unique domain name and contact details. Simply select a destination, choose dates and our platform gives you real-time availability and instant quotes. We offer you some of the most competitive rates on the market, with frequent special offers and extra incentives. Our travel experts have unique knowledge of each villa and the surrounding areas, giving you the best possible guidance and advice. Earn incentives by referring a client to us, either in person or through an easy-to-use platform. We offer concierge services for everything from attraction tickets and car hire to airport transfers, private chefs and butler services. We provide you with weekly newsletters with updates, company news, special offer and extra incentives.